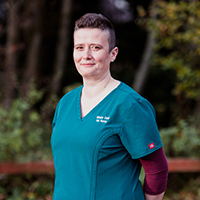 Vibeke or 'V' as we call her, joined the practice on 1st June 2015 - moving here from Denmark in 2013 and worked in Glasgow before moving up to the Highlands, following a 15 year dream to live and work here. V previously worked in a mixed practice in Denmark. She has a collie called Joey and and Icelandic Horse called Katla.